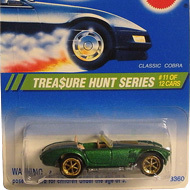 12/12 from the 1995 Treasure Hunt series. 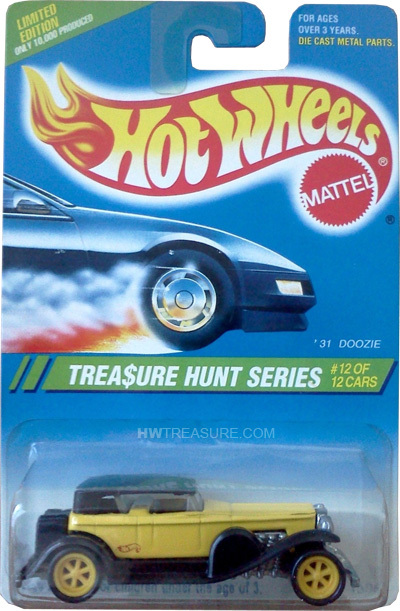 The Doozie features yellow paint, black fenders, running boards & roof, and a red Hot Wheels logo on the sides. It has clear windows, a black interior, yellow Pro-Circuit 6-Spoke wheels, and an unpainted Malaysia base. The Doozie made its debut in the 1977 Flying Colors series and is based upon the 1931 Duesenberg Model J. Each luxury vehicle would have a custom made interior and chassis for its owner making it very expensive and a status symbol.